Can't get enough of mixing neon pink and black. My favorite item has got to be the DIY boots shown in the photo. Black boots are way too common and drab for my liking, so I decided to spice things up with thrifted neon pink belts, Swarovski crystals and thick black chains. One of the first shoe DIY projects for me, and I must say I really love the look. Got lots of DIY ideas for my biking boots, but that shall be saved for a later date. 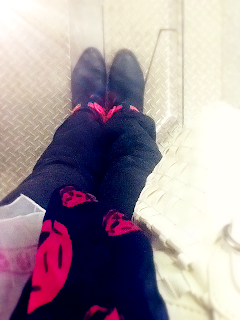 The boots go really well with black jeans and my beloved black/pink skull scarf from Alexander McQueen. The weather's too warm for a stole or thick scarf these days, so the McQueen chiffon serves as a good accessory! Crazy schedule these days, on top of unearthly sleeping hours. Sometimes I feel like I'm living in another time zone. Can't wait for summer to come, when I can have more time for innovation and creativity. Looking forward to embark on the many projects that I have in mind!